Win32 console application for manipulating program windows. Of course not! However, not everyone agrees... One of Cmdow's many features allow the user to hide program windows which has led to 40% of anti-virus vendors classifying Cmdow as anything from a hacking tool to a trojan†. On the other hand, 60% of anti-virus vendors regard Cmdow as completely safe. You can view the anti-virus scan results yourself. Download and extract the latest version of the Cmdow archive, then upload cmdow.exe to VirusTotal. You'll end up at a page like this: https://virustotal.com/en/file/767b877e735c425bf05c34683356abfde4070b092f17a4741ea5ac490611f3de/analysis/ (note, the long hexadecimal string in the URL matches the SHA256 checksum of cmdow.exe, v1.4.8 in this instance). Obviously, if you have any doubts about the safety of Cmdow then don't use it or audit the source code yourself. Auditing should be fairly straightforward as the code is self explanatory with liberal comments and there is no assembly or binary blobs. It compiles without errors or warnings using the free Code::Blocks IDE. There is even a Code::Blocks project file (cmdow.cbp) included in the Cmdow download. † Ten vendors actually regard passing a zero to the Windows API function ShowWindowAsync as enough to create a trojan! Cmdow is a Win32 commandline utility for NT4/2000/XP/2003/2008/7 that allows windows to be listed, moved, resized, renamed, hidden/unhidden, disabled/enabled, minimized, maximized, restored, activated/inactivated, closed, killed and more. It is a small standalone executable. It does not create any temporary files, nor does it write to the registry. There is no installation procedure, just run it. To completely remove all traces of it from your system, delete it. Cmdow was written with batch file programmers in mind. Particular attention has been paid to Cmdows output making it easy to process with the 'FOR /F' command found in the Windows command processor (cmd.exe). This form of CMDOW lists window details. 0x1A0142) or caption (window title). Caption is case insensitive. Use asterisk before/after caption to match zero or more characters. At symbol '@' may be used to refer to this window. eg 'CMDOW @ /HID'. visible level 1 windows that do not have an owner). /B      Bare format. Does not print the field names when listing windows. characters and Captions/ClassNames to fit under 80 characters. Use this option to disable this feature. its absolute width and height in pixels. Handle         Handle of the window, in hexadecimal format (0x000123AB). level 2+ are child windows. Pid            Process Id of the window (Task Manager also shows Pids). Active, Inactive, Enabled, Disabled, Visible or Hidden). for child windows it is their top level window. Width, Height  Absolute width and height of the window in pixels. Image Names on its Process tab). This form of CMDOW performs a single action typically affecting all windows. clicking the taskbar and selecting 'Tile Windows Horizontally'. clicking the taskbar and selecting 'Tile Windows Vertically'. dialog box open (typically the window displayed by Help | About). /FS     Switch the window running this process into full screen mode. /WM     Switch the window running this process into window mode. 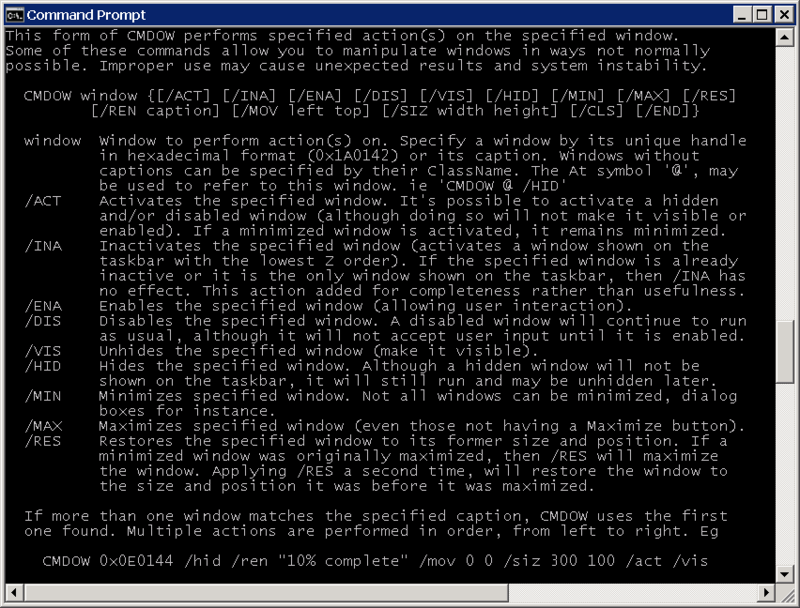 This form of CMDOW performs specified action(s) on the specified window(s). 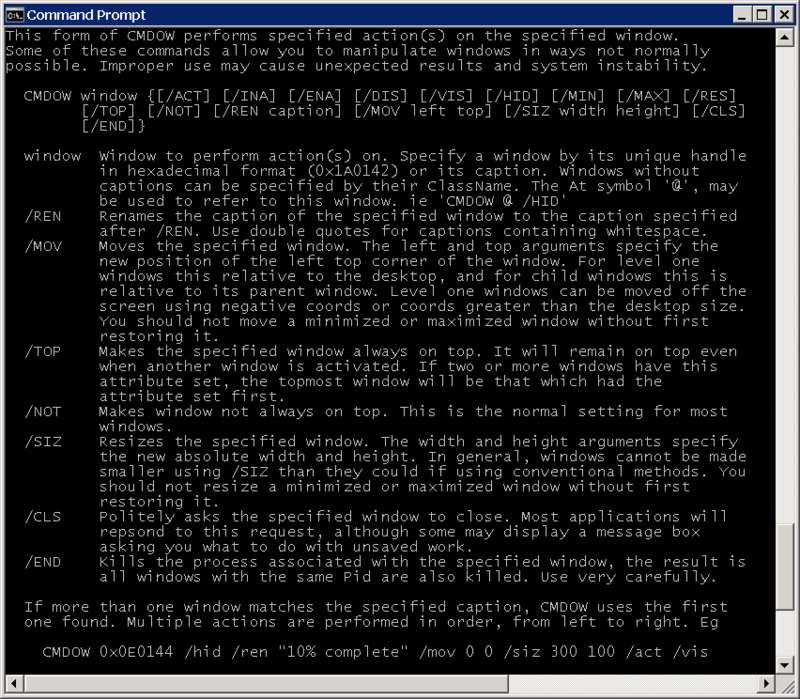 Some of these commands allow you to manipulate windows in ways not normally possible. Improper use may cause unexpected results and system instability. enabled). If a minimized window is activated, it remains minimized. no effect. This action added for completeness rather than usefulness. /ENA    Enables the specified window (allowing user interaction). as usual, although it will not accept user input until it is enabled. /VIS    Unhides the specified window (make it visible). shown on the taskbar, it will still run and may be unhidden later. /MAX    Maximizes specified window (even those not having a Maximize button). the size and position it was before it was maximized. after /REN. Use double quotes for captions containing whitespace. asking you what to do with unsaved work. all windows with the same Pid are also killed. Use very carefully. first one. To override this add the /DBM (Don't Blame Me) switch - DANGEROUS. 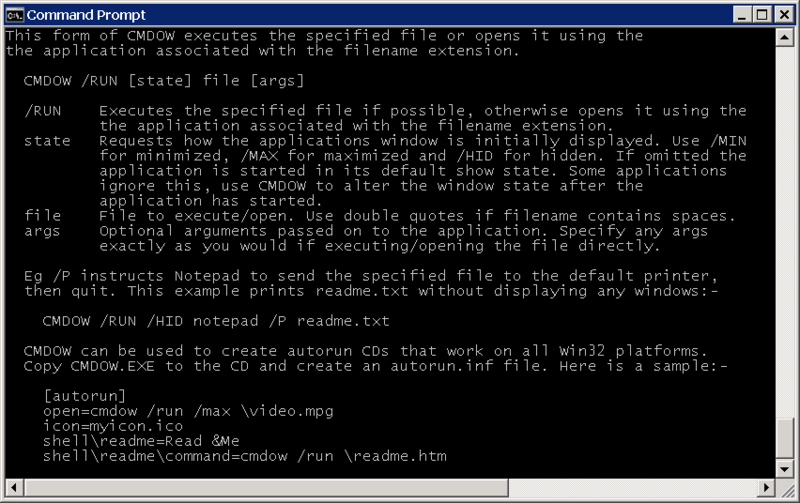 This form of CMDOW executes the specified file or opens it using the application associated with the filename extension. application associated with the filename extension. file    File to execute/open. Use double quotes if filename contains spaces. exactly as you would if executing/opening the file directly. where 0x010052 is the window handle of the window titled "untitled - notepad". if "%%a"=="0" set "WIDTH=%%b" & set "HEIGHT=%%c"
cmdow /run /hid mybat arg1 "arg 2"
Batch file to alert Administrator if the number of windows shown on the taskbar changes (as might be the case when an application or the operating system generates an error message, or may be backup software is prompting for a tape etc). 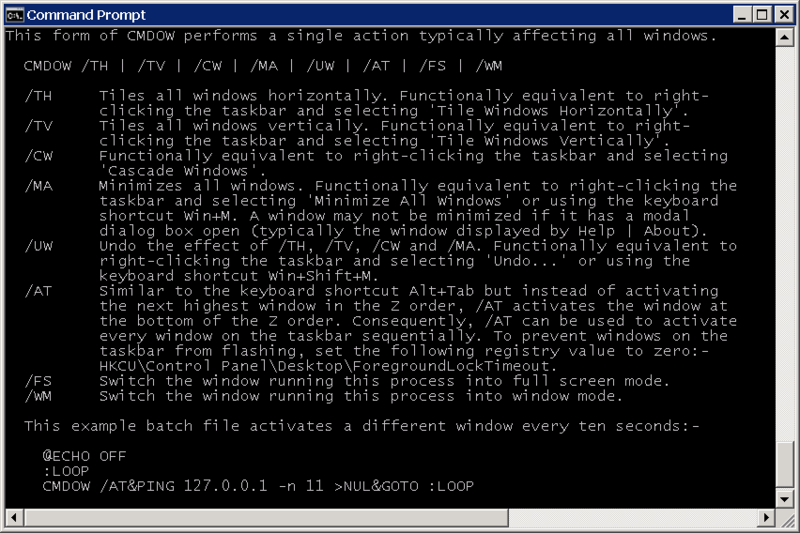 Loops every 60 seconds until number of windows changes. ping 127.0.0.1 -n 61 >nul & set "THIS=0"
if not defined LAST set "LAST=%THIS%"
net send administrator Change in windows on taskbar. echo Here we are again, back in our maximised window! How can I filter on image name and caption? How can I filter on multiple window properties, for example, visible explorer.exe windows wider than 1000 pixels? How can I disable or hide the desktop? Running Cmdow without any options lists all windows. The window at the top of the list is the desktop window only as far Windows is concerned (and has a level of 0). However, the window that you and I know as the desktop is found at the end of the list. It will typically be the last window listed with a level of 1 (and by default its caption is "Program Manager"). So running Cmdow "Program Manager" /hid will hide the deskop. If you have another window titled "Program Manager", then you'll need to use an alternative method. See the example scripts. On a W2K machine running a number of applications that monitor our servers and networks, I have a batch file that runs Cmdow /AT every 20 seconds. Sometimes Cmdow fails to activate an application window, instead the taskbar flashes blue. When I use Cmdow at a command prompt or in a batch file and try to change the console title. Why does the title revert back when Cmdow finishes or when the batch file ends? This has been fixed in version 1.4.1. How can I undo the effects of tiling, cascading or minimizing all windows? In version 1.4.2 the /UM switch has been superseded by /UW. This new switch will undo the effect of tiling/cascading and minimizing all windows. To maintain compatability with existing scripts, the /UM switch can still be used even though it's no longer documented on Cmdow's helpscreen. /UM now has exactly the same effect as /UW. 1.4.8 2014-12-30 Help page typos corrected. Output can handle 5-digit PIDs. 1.4.3 2004-12-19 Fixed bug where renaming the current console window would fail if the new caption title contained whitespace. Sizes are based on the entire window list, not just what is displayed. Help pages updated. Internally: Remove process name length test, as WideCharToMultiByte already restricts it. Combined multiple printfs. Substituted some if/else assignments for ternary operator. 1.4.2 2003-08-18 /UM seperseded by /UW switch. See FAQ's for details. 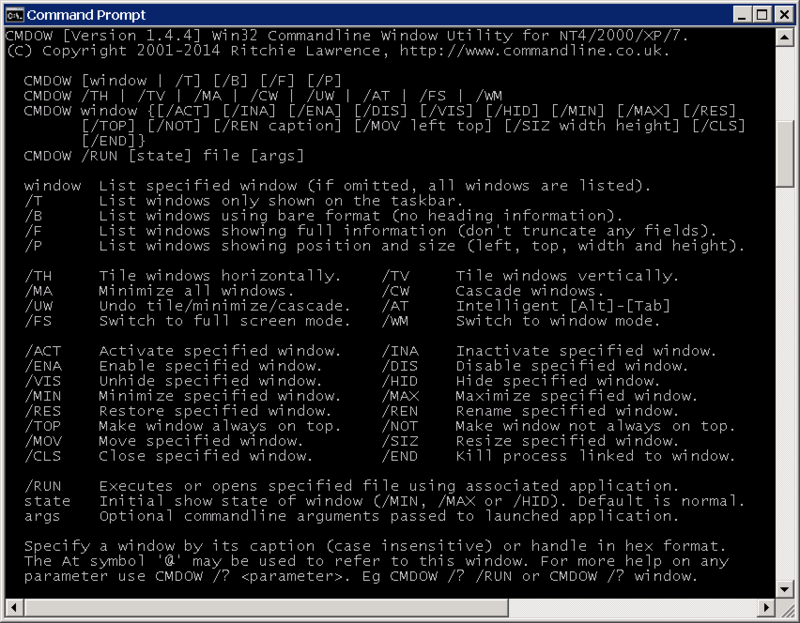 1.4.1 2003-05-14 Cmdow can now rename the console window that launched it. Previously the title would revert when Cmdow exited. 1.4 2002-11-07 Added /TOP and /NOT options to allow the setting/clearing of windows 'always on top'. Fixed argument parsing bug for /MOV and /REN options. 1.3 2002-11-20 Added /FS and /WM options to allow switching between full screen mode and window mode. 1.2 2002-10-29 Fixed issue caused when conole windows have no title. Enhance /AT feature to restore an activated window if it was minimized. 1.1 2002-02-25 Added /RUN command. Cmdow is maintained by ritchielawrence. This page was generated by GitHub Pages using the Cayman theme by Jason Long.